If everyone thought the same we would still be living in caves. For cultural advancement to occur, someone had to say, “Hey, I think I would like to have a door to keep ravenous jungle kittens from walking in as they please. That would be swell.” Then they went and made it happen. That is kind of what the design team at AGV has done with the their newest line of helmets. 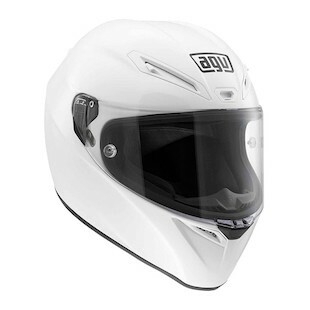 The AGV GT Veloce, like its big brothers, the AGV Pista GP Helmet and AGV Corsa Helmet, utilizes an inside-out design that has resulted in upgraded ergonomics and rider comfort. Innovations such as the patent pending seamless 3D comfort liner for superior fit and optimized ventilation, based on CFD analysis, are just two of the great features that can be found in this helmet. At its core, the GT Veloce is the combination of the Pista and Corsa models, brought together in a helmet more geared for street and touring use than for the track. As an extremely light, quiet, and comfortable option, this is a helmet that is ready for the longest of days in the saddle. From the composite fiber, carbon, and Kevlar mix shell construction, to the four shell sizes and top-tier ventilation and vision aerodynamics, this helmet is ready for the best that your motorcycling adventures can throw its way. So, if you don’t want a pre-historic jungle cat to curl up beside you as you sleep, you should probably check out the new AGV GT Veloce helmet!